Discussion in 'Traditional Folders and Fixed Blades' started by Jack Black, Jun 26, 2016. OK folks, it had to happen - There's a new cult in town!! CableGirl, Titan and Pàdruig like this. The subtle lines of a beautifully executed Lambsfoot pattern. Titan, naturalist and Pàdruig like this. nyarlotep, cigarrodog, mykel m and 5 others like this. TFBraden, Cutfinger, naturalist and 1 other person like this. TFBraden and The_Wu-Tang_Sword like this. You know I'm in favor of a new cult, Jack. I even run a retirement home for worn and wayward lambsfoots. cigarrodog, mykel m, TFBraden and 2 others like this. I know the wooden one is good because I received it from an impeccable source. I think the black one could stand more sway in its back. mykel m and TFBraden like this. Cheers Jack. It's a REAL nailbreaker. Great pic yourself, is that the rams horn one I've seen you post in the past? Here's an old Sheffield Lambsfoot by Alfred Blackwell. Alfred was the son of Joseph Blackwell, who was himself the son of a spring-knife cutler (also Joseph), and making knives in Radford Street, Sheffield from 1833. In 1861, Joseph Blackwell & Sons employed four men and three boys. The sons were Alfred (who was born in 1834) and Henry. By 1868, the firm was working from Liberty Works on Edward Street. As Joseph grew older, the reigns of the firm were increasingly taken over by Alfred, and by 1881 Joseph had retired (dying at Stannington in 1884). Alfred continued to trade in Holly Street. mykel m, TFBraden, T. Erdelyi and 1 other person like this. Here are my four Arthur Wright Lambsfoot knives, in respectively, ebony, buffalo horn, ox horn, and sambar stag. mykel m, Travman, TFBraden and 3 others like this. There great those Jack. That buffalo horn is unusual, I always thought buffalo was darker. 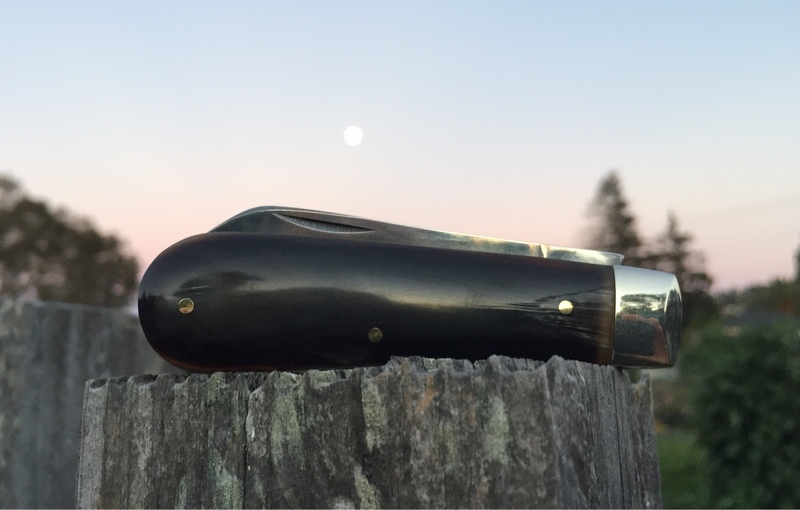 scrteened porch's post reminded me that the TEW website offer buffalo horn knives including Lambsfoot. mykel m, Ryanck93, Travman and 3 others like this. Looks like this old 4" Lambsfoot has seen some rough use It was made by John Milner & Co of Sheffield. John Milner started off in the trade around 1800, aged nine or ten. He set up on his own about 1830, employing his son, and three apprentice hafters. In his day, John Milner was said to be the best spring-knife cutler in the town, the inventor of the lock-knife, and possibly of the fly-open knife (or switchblade). After his death in 1863, his son (also John) continued the firm until his own death in 1890. After that, Milner & Co continued until 1946, when it became a limited company. It had ceased trading by the end of the 1960's. mykel m, TFBraden, deltaboy and 1 other person like this. Jack, thank you for founding The Guardians, my friend. I am most definitely in! Ryanck93, TFBraden and Pàdruig like this. Great idea Jack. Nice knives everyone. Jody744, TFBraden, navaja and 1 other person like this. Nice idea for a topic. I've been looking for a good example of the lambsfoot. Using the noparse tag will display the code instead of the photo (so that others can cut and paste).